Unconfirmed : Sudan's troops dig trench 40 kms inside Ethiopia border. Invasion? Unconfirmed : Sudan’s troops dig trench 40 kms inside Ethiopian border. Invasion? US-based Ethiopian broadcaster, ESAT, reported on social media today that Sudanese soldiers crossed the Ethiopian border. They said to have advanced up 40 kilometers within the country’s border. The soldiers are armed with heavy weaponry and artilleries. 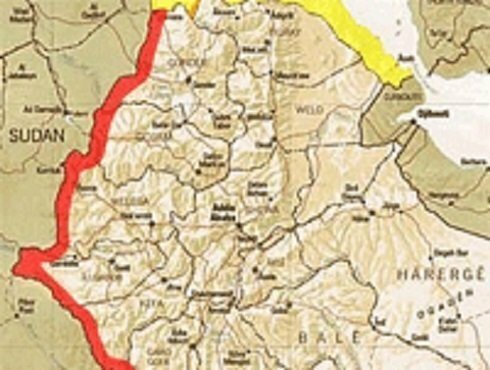 ESAT cited sources from the region. The report added that the soldiers are defying advice from Ethiopian soldiers to halt their move but to no avail. The troops are also reportedly digging trenches in the position where they are now; 40 kilometers inside Ethiopia. Neither Ethiopian state media nor Sudanese side reported anything like that at this time. If the news is confirmed, the Sudan’s action constitutes an act of invasion. The two governments have signed joint border security arrangements since three years ago with alleged intention to fight “illegal activity” along the border. Why this news will come as a surprise, if not shock, for many is that the regimes in Sudan and Addis Ababa have been longtime allies; since the time of Tigray People’s Liberation Front (TPLF)guerrilla times. Sudanese authorities, including Omar Hassan Al-Bashir, are usually courtiers at TPLF’s anniversary celebration events in Mekelle, Tigray. Furthermore, Sudan and Ethiopia are on the same page regarding the dispute over Ethiopian Renaissance Dam – a multi-billion dollar project – and showed no signs of strained relation over the years, too. Besides, the Sudanese government has internal issues as it is dealing rebel forces who have recently merged to wage their struggle against Al-Bashir’s government.